This Giveaway has ended. Thanks to all that entered! These Eco-fabrics are made with raw materials and not grown with any pesticides or manufactured with any harsh chemicals. Soybean fiber is spun by a machine from protein dregs leftover from tofu production. The resulting fiber is soft and silky with a natural pale gold color. The soybean fiber has amino acids necessary for the human body and plant activating factors, which can be great for the skin. It has the smoothness of cashmere, but it doesn’t cause harm to the environment and is a great green alternative. Soybean fibers also absorb UV rays for safe protection in the sun plus have natural anti-bacterial qualities. 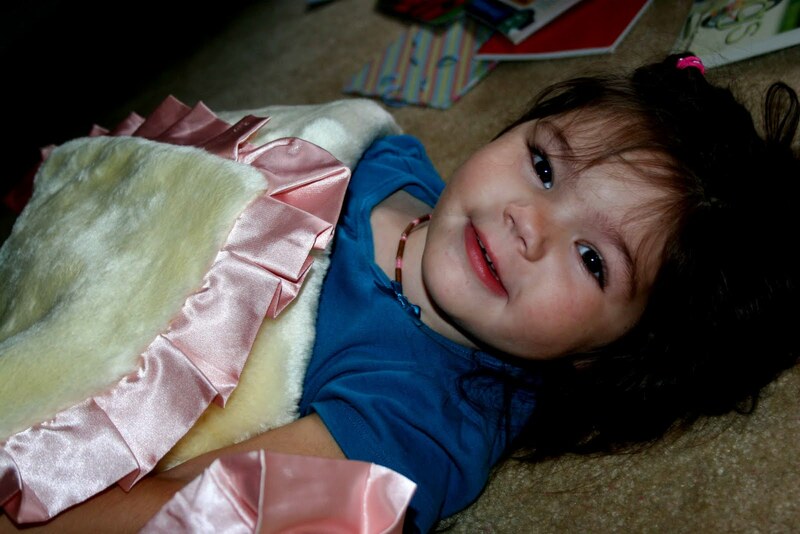 When Ella received her Luxury Blanket made with soybean fibers from Lotus Bebe, she was in flunky heaven. It was the closest blanket in texture to her old flunky and she hasn’t put it down. 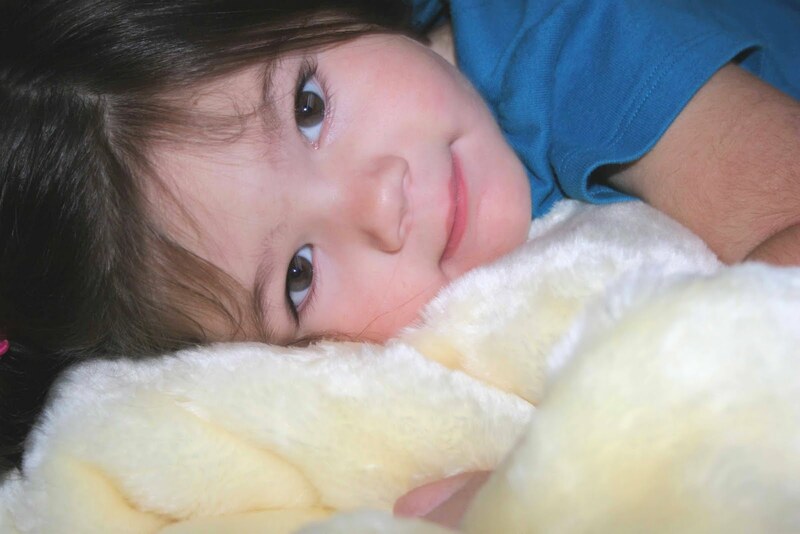 She has loved cuddling up to the ultra soft plush texture and snuggling up close when she’s sleeping. I was scared the super thick plush fabric might make her sweat, but the soybean fiber has a natural moisture wicking property which wicks moisture away from the skin. A big plus in my book since her last flunky made her sweat like crazy! Another thing I loved about the blanket is that it was wrapped in a ribbon with a 100% recycled tag that you can actually plant and watch wildflowers grow! 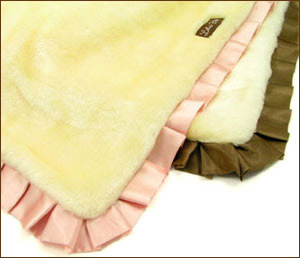 The Luxury Blanket’s trim is lined in either brown or pink soy silk box pleated edge. The blanket is 42X31″ and is large enough for older children. But younger babies will love rolling around on it too. It would also make a great stroller blanket for when out and about in cool weather, especially with the UV protection! The soybean fiber is extremely durable, so this Luxury Blanket will last throughout the years! Lotus Bebe also makes Bamboo fiber blankets which are just as luxurious! The Giveaway: Lotus Bebe wants to give 1 Lucky reader a Luxury Blanket in their choice of brown or pink silk. A $98 value! Rules: You have until 11:59 p.m. EST September 20, 2009 to enter. The winner will be chosen by random.org and announced after they respond to the winning email. The winner has 48 hours to respond to the winning email, or a new winner will be chosen. You must leave your email address! This contest is open to the US. How to Enter: Tell me which is your favorite Lotus Bebe blanket and also which color trim you’d like to win. Click on “Comments” to leave your post. Make sure to leave your email address!! I cannot contact the winner without it! I love the Petite Blankie in pink.